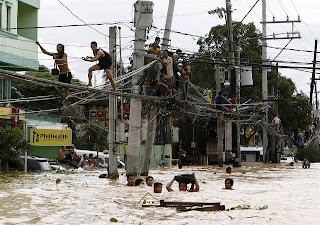 My Life and Activities here in KSA..: Typhoon "Ondoy"
Last Saturday in my country,a devastating heavy downpours damaged my beloved Phillippines.It was not a strong typhoon,but the the heavy downpours of rains,continously for the next 24 hours has turn a city into a sea.Take a look of one picture I attached,how this typhoon Ondoy,damaged the whole part of Metro Manila and Luzon areas.Floods in the city has been terribly affecting all folks in life.No Board Exam,No Bar Exams,Class in School eitheir in elemetary,secondary and tertiary were suspended,No Office work and diff. 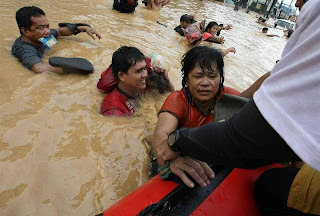 agencies were close,even markets,because the Floods water level is dangerous for human lives.In time like this the "BAYANIHAN"spirit in every Filipino prevail.Take a glance of the picture.Helping one another is what the Filipino known for..Mabuhay ka Kabayan! !